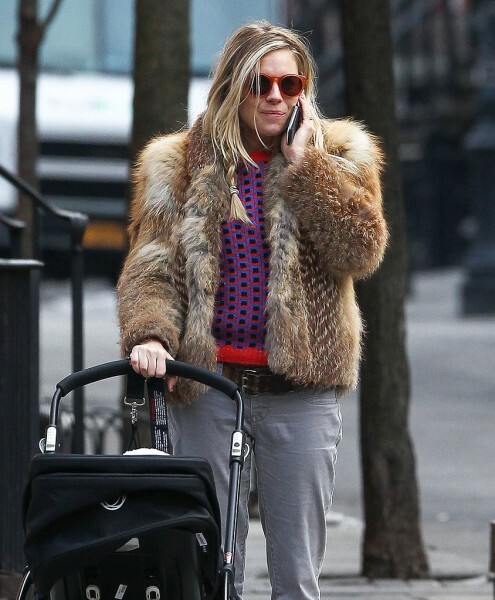 Sienna Miller walking post with bb Marlowe. - Oh No They Didn't! Sienna Miller walking post with bb Marlowe. Sienna Miller wore her hair up and donned a fur coat this afternoon to take her little girl, Marlowe Sturridge, to a park in NYC. Marlowe and Sienna headed to the US after a stint at home in England. Over the last few weeks, Sienna was in London to support her nearest and dearest. She attended the launch of her sister Savannah Miller's. bb girl looks just like her dad imo. I have a friend who dresses and wears her hair like that all the time. It's so awful.